Güsfreude simply couldn’t accept it. What was the meaning of light if it couldn’t dispel the dark? If Antonio got his clutches on Beatrice, and if he trained his god-forsaken necrometer on the Local Void, where would all the angels go? She knew that life was a one-way affair, time-wise that is. She saw no reason that the afterlife would be any different. There was no point in looking backward. There was no such thing as a time machine. All we have in that regard is memory. She was haunted by Hamlet’s description of the afterlife as a country beyond whose bourn no traveller returns. Yet what did Shakespeare really know, with his sixteenth-century confusion, his cloud-capped towers and the baseless fabric of his vision? His deepest characters ended up wading through rivers of blood, raging on heaths — Kill! Kill! Killl! Kill! — or accusing the gods of treating us the way flies were treated by nasty boys. Europe’s God was slowly becoming a Beelzebub, a Lord of the Flies. Golding’s novel was just an update on the continuing saga of humanity’s reversion from order to chaos. Hamlet himself couldn’t tell a ghost from a demon. Güsfreude could see all around her that there was more than was dreamt of in Shakespeare’s philosophy, whatever that was. She also heard that there were exceptions to Hamlet’s rule about the country from whose boundary no traveller returns. There was Jesus, whose death was no mere murder, but represented the pain that God himself went through because of His love for His creatures. There were thousands of bodhisattvas — souls who chose to help others through the difficulty of this world rather than bask in fields of asphodel. And there was Dante, who travelled down into Hell and back, determined to recount the horror he saw so that he could also convey the good (she remembered his immortal words, per trattar del ben ch'i' vi trovai, dirò de l'altre cose ch'i' v' ho scorte). Finally, there was the doctrine of reincarnation itself. Samsara. There must be some mechanism that allows a soul to return to where it came from. She was convinced that leaving the Soul Star was the only way her soul could find peace — even though peace was offered to her on a golden platter, no questions asked. Yet how could she extricate herself from the dense mass of infinite souls, and travel back to Earth? After two billion years of research — and over 8 million prototypes — the early mystic scientists of Vicino Prossimo realized that every being, no matter how exalted or base, could be infracted in an infinitesimal form. The mystic scientists also perfected the design by which each being could be possessed of this fractal (which was spliced into their genetic coding), and by which they could, at the moment of their death, not only be aware of it, but also be capable of harnessing the subatomic energy within it. Fitted like a bird with migrational instinct, the being could then beam itself to the Soul Star. “Migration of the Bar-tailed Godwit Limosa lapponica.Bar-tailed Godwits have recently (March 2007) been shown to undertake the longest non-stop flight of any bird. 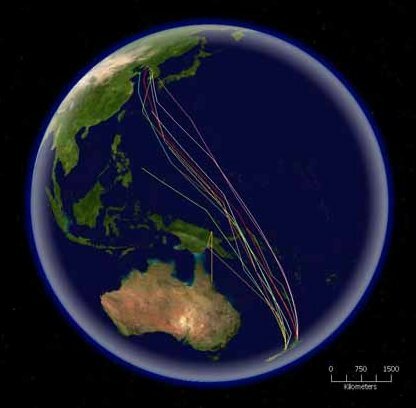 Using satellite tracking, birds in New Zealand were tagged and tracked all the way to the Yellow Sea in China.” From Wikimedia Commons. The bar-tailed godwit (photo by Dhaval Vargiya). “Its migration includes the longest known non-stop flight of any bird and also the longest journey without pausing to feed by any animal.” From Wikipedia. The being can take this flight if it chooses. For the Soul Star isn’t a commandment. It requires no oath of allegiance. Rather, it’s a refuge and resting place for beings that want to live forever in peace and harmony. No being can be indoctrinated into it by religion, forced toward it by physics, or forced away from it by threats. It’s simply the choice all beings are offered at the moment of their death. The early Vicinese made it clear that the Soul Star has nothing to do with essences or magic. Nor does it really have anything to do with a star — that would have been poetic. It’s closer to a non-thing of spirit than a thing of matter. In quantitative terms, it emits almost no light and possesses almost no gravity. Although it’s infinitely dense with infractions, the Soul Star is almost weightless. The early Vicinese designed it so that it would operate according to a law which they called the mass of infinitesimal infraction. They explained that just as protons or leptons don’t greatly increase the mass of an object, so ever-smaller particles don’t greatly increase its weight. The object becomes infinitely dense the deeper one goes within it, yet in terms of mass and weight the ever-smaller fractals weigh ever-closer to nothing. A piece of cotton fluff three centimetres from the Soul Star would keep drifting. The piece of fluff wouldn’t get sucked in, wouldn’t fall with crushing speed toward an event horizon. That would be the work of a black hole, or imploded star. This is a soul star. The law appears contrary to the laws of physics as we know them, and for this reason the early Vicinese used a quasi-magical vocabulary, referring to the being fractals below the size of one yotta-nanometer as a soul. They knew that the fractal wasn’t a soul in the theological sense, yet just as they used star to indicate its emanating and centripetal force, so they used soul to indicate its value. They were, after all, scientists of a mystical bent. Güsfreude knew that the Soul Star wasn’t a prison. It had almost no weight, almost no gravity to pull her into its sphere. She was here of her own free will. Why would she be forced to remain? Güsfreude thought of the sun and the quatuordecillion (10 to the power of 45) photons that escape from its surface every second. She thought of how a photon makes its way through the octillions upon octillions of like-minded sparks, up from the depths of a star. Then, after tens of thousands of years, the photon reaches the surface, at which point it breaks free from the crushing gravity of the sun. How could such a tiny thing escape from the gravity of such a massive object? The only way, she figured, was if it weighed almost nothing at all. Then she thought about love and how much it weighed. Her love was bound like light to energy, like feelings to her thoughts. Like her feelings to her grand-daughter. Güsfreude thought of Beatrice, and broke free from Heaven’s Light.